The Olympic road races were full of nasty crashes, including Samad Pourseyedi’s header into a concrete wall and Annemiek Van Vleuten’s head-over-heels tumble at speed. Thankfully, the Olympics are done with the treacherous descent of the Vista Chinesa. However, that doesn’t mean that there won’t be any more bike crashes. 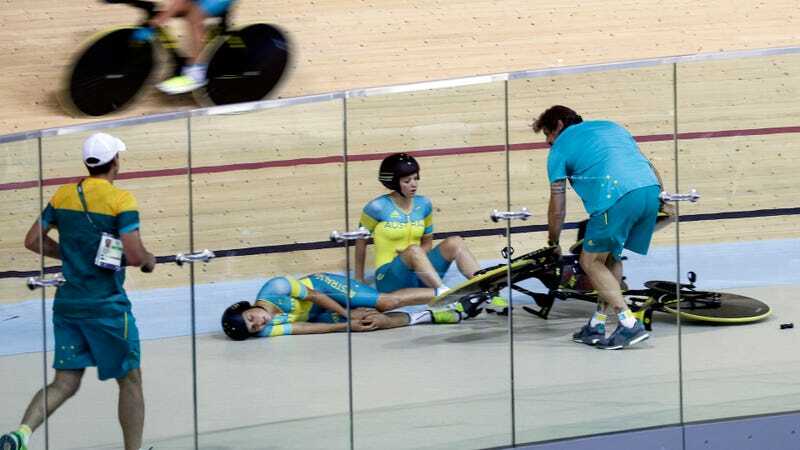 While practicing for the team pursuit competition this afternoon in the velodrome, the world record-holding Australian team crashed en masse during a practice. There is no video available of the crash, but according to Cycling Australia, the team crashed at full speed heading into the final turn after a touch of wheels. Everyone except for leader Annette Edmundson fell. Ashlee Ankudinoff, Georgia Baker, and Amy Cure were able to walk off rather easily, and they were treated for friction burns from falling on the track at such a high speed. But Melissa Hoskins fell much harder than the other three, and she was immobile on the track for five minutes until she got stretchered off. The Sydney Morning Herald reports that she has a hip injury. Photos from the scene show medics treating her hip. She was released from the hospital after just a few hours. Incredibly, Hoskins did not suffer serious injury and may actually compete on Thursday.